Archie Miller’s first Indiana (No. 46) squad won’t be representative of his tenure in Bloomington; he needs some time to replenish the roster with hand-picked recruits. But the former Dayton head coach can get Indiana to the Big Dance this season. Our model pegs the Hoosiers as the worst team to claim an at-large bid. Number of teams that should make the NCAA tournament: Seven. Michigan State, Minnesota and Purdue should be in. Northwestern shouldn’t be too far behind that group, thanks to all the experience the Wildcats return. Then comes a deep bubble crew that includes Maryland, Wisconsin, Michigan, Iowa and Penn State. It’s hard to imagine all of those teams finding a seat at the table, but three out of five seems like a reasonable expectation on pace with what the Big Ten has sent dancing in recent years. When other schools seem to move on from a player, or put other players ahead of him, frequently it is because they already think he’s going somewhere else. I feel more confident about Romeo than Garland, and if I could only have one, I’d take Romeo anyway. I really don’t understand the Vandy thing. That would be like a star QB from Bloomington picking IU over UM when UM also wanted him. I think many people automatically discount NW because it’s NW. Collins has a strong roster up there. They are well coached, talented and play well together. They are good. Read it, and agree. It’s a great piece, made me homesick (all the way from SoCal). I’m not even sure Vanderbilt in basketball is equal to IU in football. I’m excited about the season and our new system too, but let’s not put the cart before the horse just yet. While you discount the contributions of some former players, they represented a LOT of points. Those have to be replaced, and while players like Green looked great and I hope for great things out of him this year, it was against an NAIA school. Let’s see what they do against high major schools before we put unrealistic expectations on this team. There are many positives around the program today, but there are many questions about this year’s team too. I guess in short, in saying be excited, but be patient too. This could be an up and down season. Completely agree. Very optimistic and excited, but trying to temper with a dose of realism. Vandy does make the NCAAs fairly regularly. I don’t know that IU football would qualify for the top 64 in football as often!! Thanks for adding some reason and sanity into the discussion. Even so, it’s pretty close. I would take the “new” Devonte Green over the “old” James Blackmon, and the “new” DeRon Davis over the “old” Thomas Bryant in a heartbeat. Unfortunately OG was a non-factor in last season’s B1G Race. Last year’s team was definitely “so-so”! Coaching, chemistry, player use, scheme on offense and defense, motivation, etc. were all involved. I think that this year’s Team would win 8 out of 10 match-ups against last year’s team. Ole, your side of the argument is not the only sane and reasonable position. But each of the three were focused on their NBA careers, not on Indiana competing in the B1G and making the NCAA Tournament! I hope you know what you’re speaking about. However IU has at this time only played 1 exhibition game. Some players were held out and we really didn’t look all that great! Time will tell, Archie did a very good job at Dayton. IU is a much bigger show, tougher conference, much bigger expectations, and no let down on pressure to win it all. Not everyone can work well under these pressures. Actually few can, hopefully Archie is one who can. I recommend the “Hoosier’s Golden Archie’s”, get McDonalds to sponsor them. Get away from Adidas and the scandal. Everyone in the arena gets an order of fries with their ticket. Love it when someone makes these type of bogus claims. OG focused on the NBA? He was injured. TB? With his passion for playing and his teammates? JBJ? Probably his best season in the IU uniform and left it all on the floor for us. One, it’s not just “my side” as I was complimenting Cal. Two, he and I are attempting opinions with the homerism tempered so as to ground our opinions in some basketball logic. Three, never said others were entitled; but obviously I’m more in agreement with logic than with pie-in-the-sky. I love IU as much as everyone else. I have hope just like everyone else. 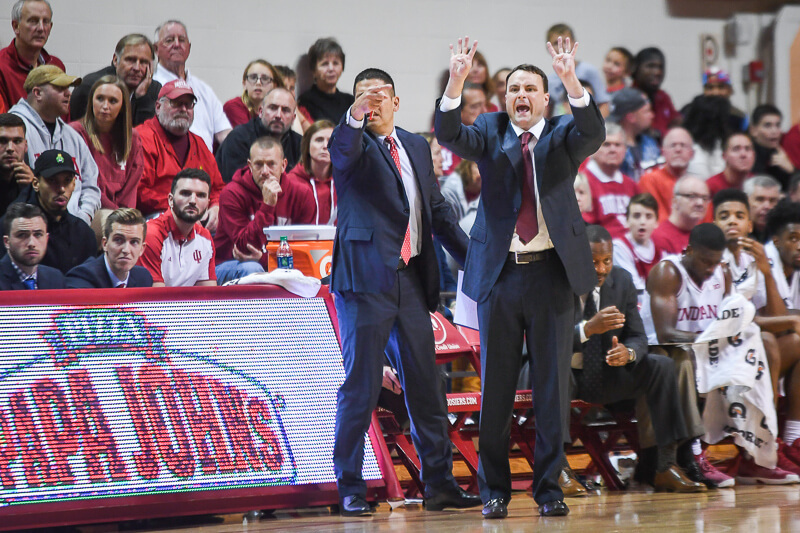 Totally off-topic but not addressed anywhere else in the forum that I could find… does anyone know if Crean’s new position as ESPN Analyst will affect how much we have to pay out to him for being fired? Alex? I recall Glass saying at press conferences last year that there was an “offset” in buyout. Meaning: dollars earned in coaching or broadcasting would be subtracted from amount IU owes Crean annually for remaining years of contract.